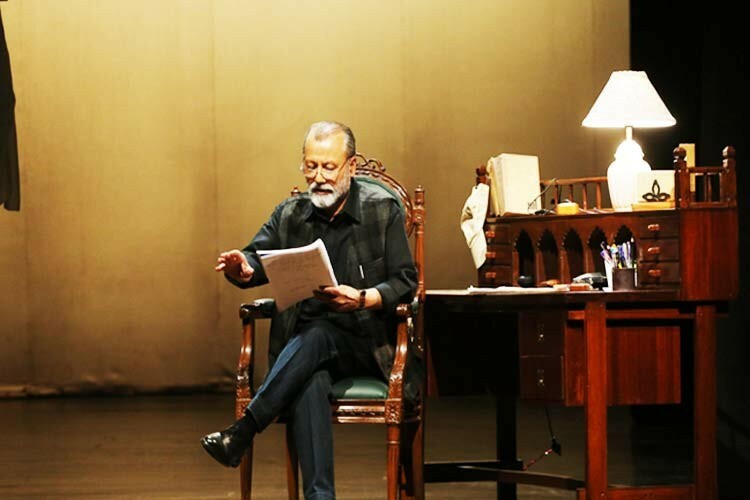 Dopehri, a one-man act by veteran actor Pankaj Kapur is a dramatised reading, written and directed by Mr. Kapur himself. Its a well-written tale narrating the journey of a helpless old lady from the clutches of loneliness to self discovery as she rediscovers her identity. Pankaj Kapur successfully narrates a poignant tale with a fair amount of humour. A few minutes into the performance, we forget that he is the only person on stage, and are transported to the world of Amma Bi. The story is set in Lucknow and revolves around the primary protagonist Amma Bi and her life in the large family house – Laal Haveli. At the age of 65, living in the Haveli all by herself, Amma Bi gradually starts losing interest in her life. Her son is abroad, and she yearns to see her grandchildren. An old rusted Austin car and a tree with dried leaves, a torn kite clinging onto its branches, represent Amma Bi’s life and situation in a metaphorical way. Amma Bi starts experiencing uncanny incidents in the Haveli during the afternoon (dopehr) everyday. Mentally shaken by this, Amma Bi makes every possible attempt to convince her domestic help Jumman to stay with her in the Haveli. When the incidents do not stop, Amma Bi finally considers the suggestion of her late husband’s friend and her only trustworthy confidante in the city, Mr. Saxena, to keep a paying guest at the Haveli. A new chapter of Amma’s life starts when Sabeha, the paying guest, enters the portals of the Haveli. Sabeha is from Amma Bi’s maiden town Jaunpur, and Amma Bi gives her the place of a daughter after initial reluctance to keep her as a paying guest. Sabeha is full of life and gradually washes away all gloom in Amma Bi’s life, unknowingly providing her a reason to live and enjoy life the way it is. The domestic help Jumman’s attraction towards Sabeha also gives the audience several moments of laughter. With the help of Sabeha, Amma Bi rediscovers her lost identity, that of Mumtaz Siddique. Dopehri is an unconventional play; the stage is perfectly arranged with moderate use of props. The rocking chair, the bench, the study table and the terrace help the audience aptly visualize Ammi Bi, Jumman, Mr. Saxena and Sabeha in various activities and conversation throughout the play. The story line written by the Mr. Kapur twenty years ago, touches subtly upon issues like loneliness of the elderly, truth about old age homes, and women empowerment. Mr. Kapur modulates his voice as he narrates the dialogues of each character, bringing his characters to life. The ambience lighting changes with the mood, the background sound echoes the act and ensures that the audience is immersed in the life of Amma Bi. The whole story flows in a light hearted manner giving the audience, a series of occasions to laugh their heart out. Its only after the show is over one would realise the strong messages subtly put behind every conversation or narration. The last scene of Ammi Bi holding out her cheque towards the moon, basking in her newly found identity, is etched in the memory for long. Next story Lesser known facts of Mughal-e-Azam, the legendary movie.